And so today brings and end to another Digital Dozen themed week. I've got to say that my bottle of JOSS Will Not sure got a work out this week. It was my base polish and photo prop for the entire week. Rightly so too, it's one pretty awesome while polish. All my photos have been only one coat of this awesome white. For my final look I admit I got a bit lazy. I've printed some water decals. Hats off to you if you know what they are. These are the four elemental ambigrams from the book Angels and Demons by Dan Brown. An ambigram is a word, art form or other symbolic representation whose elements retain meaning when viewed or interpreted from a different direction, perspective, or orientation (thank you wikipedia). For the record, my thumb had Illuminate on it. Tomorrow brings news of the 31 Day Challenge for 2017 so make sure you swing by for that! Around this way they are easier to read. Wow, these are really neat! 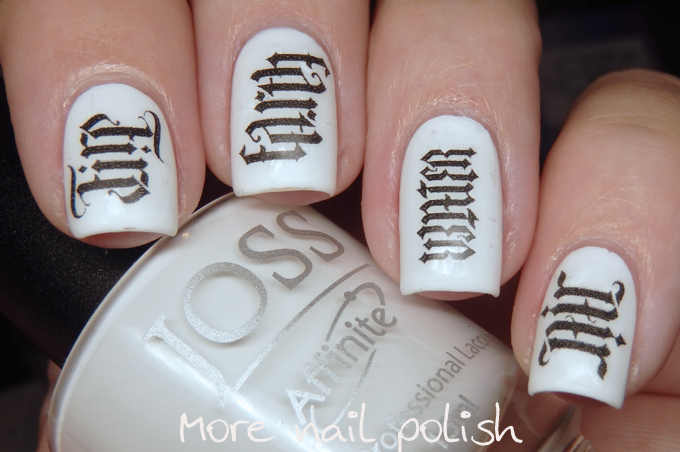 Recently I read the "Angels and Demons" from Dan Brown ;-D Nice manicure! I love these. So clever!